Griffon in Action is a comprehensive tutorial written for Java developers who want a more productive approach to UI development. After a quick Groovy tutorial, you’ll immediately dive into Griffon and start building examples that explore its high productivity approach to Swing development. Source code can be found here. There is no longer a griffon command. Gradle or Maven are used instead. Lazybones is required to create a project, instead of archetypes. Plugins are regular JAR files. Groovy is no longer the default language of choice. The Griffon Guide is your first stop for documentation. 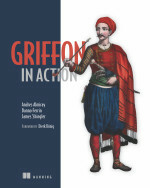 It discusses all features available to Griffon applications. API docs are available in full Javadoc and in beautified sources.